One of the first questions we usually encounter when speaking with a new facility is "Are CRNAs really independent? Are there any liability issues with CRNAs for surgeons?" 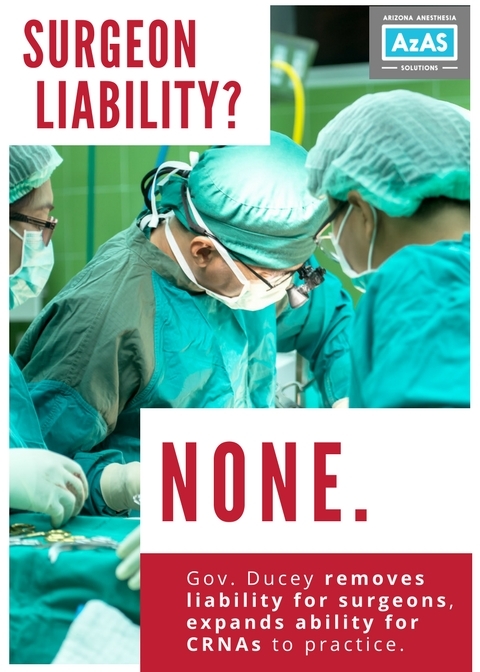 While this question has been asked and answered for many years with a "no" - according to decades of case law, liability in medical malpractice is an issue of control - none the less, the false perception persisted. This was despite years of educational efforts demonstrating that if a surgeon did not control the anesthetic, they could bare no liability for it - and the fact that surgeons had in fact been held liable for anesthesia administered by a physician, when control was demonstrated. — Arizona Statute 32-1634.04, added in 2017. To correct this perception, the managing partners of AzAS decided to bring the issue to the capitol via their professional association, which they also led at that time. 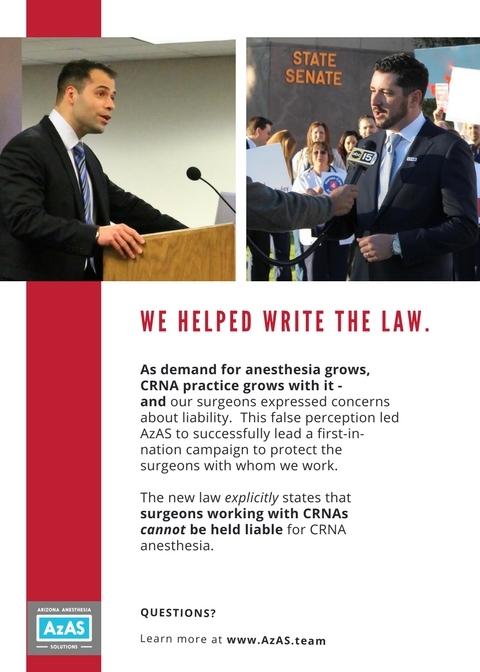 Thanks to the efforts of a broad coalition of supporters, over 100 surgeons and dentists, and an incredible team of advocates at the Arizona Association of Nurse Anesthetists, the effort was successful - and Governor Ducey signed into law first-in-nation language to remove this perception. There remains some outdated words throughout statute and regulation, but as Arizona state law is the the most influential language on scope of practice issues, an important step has been taken to remove this perception. 1. A health care institution. 2. An office of a health care professional who is licensed pursuant to chapter 7, 11, 13 or 17 of this title. 1. Issue a medication order for drugs or medications, including controlled substances, to be administered by a licensed, certified or registered health care provider. 2. Assess the health status of an individual as that status relates to the relative risks associated with anesthetic management of an individual. 4. Order and evaluate laboratory and diagnostic test results and perform point-of-care testing that the certified registered nurse anesthetist is qualified to perform. 5. Order and evaluate radiographic imaging studies that the certified registered nurse anesthetist is qualified to order and interpret. 6. Identify, develop, implement and evaluate an anesthetic plan of care for a patient to promote, maintain and restore health. 7. Take action necessary in response to an emergency situation. 8. Perform therapeutic procedures that the certified registered nurse anesthetist is qualified to perform. C. A certified registered nurse anesthetist's prescribing authority to administer anesthetics or to issue a medication order as prescribed by this section does not include the ability to write or issue a prescription for medications to be filled or dispensed for a patient for use outside of the settings prescribed in subsection A of this section. D. A physician or surgeon is not liable for any act or omission of a certified registered nurse anesthetist who orders or administers anesthetics under this section.